hpsd = noisepsd(sysobj,L) computes the power spectral density (PSD) at the output of filter System object™, sysobj, occurring because of roundoff noise. This noise is produced by quantization errors within the filter. L is the number of trials used to compute the average. The PSD is computed from the average over the L trials. The more trials you specify, the better the estimate, but at the expense of longer computation time. When you do not explicitly specify L, the default is 10 trials. Determine whether to use normalized frequency. Enter a logical value of true or false. Because this property is a logical value, do not enclose the single quotation marks. Setting CenterDC to false shifts the data and the frequency values in the object so that DC is in the left edge of the spectrum. This operation does not affect the SpectrumType property setting. If the spectrum data you specify is calculated over half the Nyquist interval and you do not specify a corresponding frequency vector, the default frequency vector assumes that the number of points in the whole FFT was even. Also, the plot option to convert to a whole or two-sided spectrum assumes the original whole FFT length is even. The System object state is Unlocked — noisepsd performs double-precision analysis. The System object state is Locked — noisepsd performs analysis based on the locked input data type. If you do specify the Arithmetic parameter, i.e., use the syntax [h,w] = noisepsd(sysobj,'Arithmetic', ARITH), review the following rules for this method. Which rule applies depends on the value you set for the Arithmetic parameter. ARITH = 'double' Unlocked noisepsd performs double-precision analysis. Locked noisepsd performs double-precision analysis. ARITH = 'single' Unlocked noisepsd performs single-precision analysis. Locked noisepsd performs single-precision analysis. ARITH = 'fixed' Unlocked noisepsd produces an error because the fixed-point input data type is unknown. Locked When the input data type is double or single, then noisepsd produces an error because since the fixed-point input data type is unknown. When the input data is of fixed-point type, noisepsd performs analysis based on the locked input data type. set(opts,'fs',48e3); % Set Fs to 48 kHz. noisepsd(sysobj,...) with no output argument launches fvtool. Compute the PSD of the output noise caused by the quantization processes in a fixed-point, direct form FIR filter. The input is of fixed-point type. noisepsd performs analysis based on the locked input data type. firfilt = dsp.FIRFilter('Numerator',b); % Create the filter object. Quantize the filter to fixed-point. 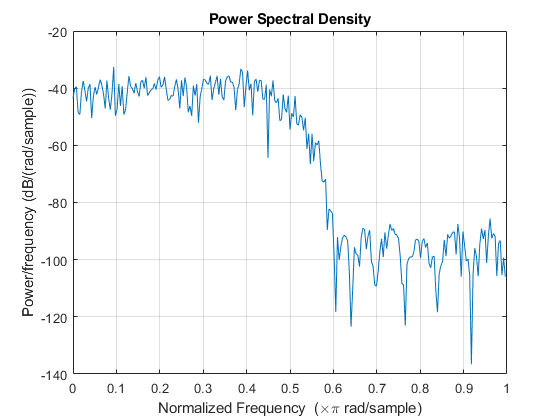 hpsd looks similar to the following figure - the data resulting from the noise PSD calculation. You can review the data in hpsd.data. McClellan, et al., Computer-Based Exercises for Signal Processing Using MATLAB 5. Upper Saddle River, N.J.: Prentice-Hall, 1998.